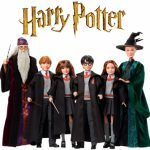 Supply of the current character assortment of Harry Potter dolls is now available to purchase in single units by character at Baby Brands Direct. This is great news for stock control ease for both online and physical retailers during the busy festive season. The popularity of the Harry Potter licence was interestingly linked in a recent article published at the BBC by Mary-Ann Russon and Hannah Gelbart, about pubs. It covered a shift towards preference for experience bars with the appeal of traditional pubs on the decline and reported that the rise in themed bars were inspired by popular culture and included the UK’s love affair with Harry Potter. These bars give customers the opportunity to enjoy some wizarding fun bringing theatre into their social meeting. Customers can dress up (wear capes) and create their own cocktails (potions), they are also given wands which are connected to the internet that then opens cabinets, turns on lights etc, create a great experience. The Harry Potter novels and movies have undoubtedly contributed so much to culture and society through the ministry of magic and inspired so many young readers into literacy. 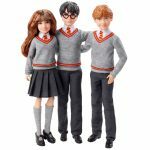 The Harry Potter dolls supplied at Baby Brands Direct have proved so popular that the assorted pack is now available to retailers by block character (Harry, Hermione, Ron, Ginny, Dumbledore and professor Mc Gonogall). The character figure dolls have been expertly manufacturer by leading toy manufacturer Mattel, owner of Barbie and each have 11 points of articulation and range from 27cm to 31cm tall. Stock up on this popular cultural phenomena to avoid overselling as the Harry Potter dolls are tipped to be out of stock with the manufacturer pre Xmas. 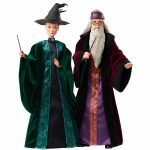 The wizarding fun Harry Potter wholesale supply of figure dolls will continue into 2019 and will be further expanded to include a Yull Ball dressed collection of the popular characters and Quidditch Potter and Malfoy! There is so much for retailers to look forward to. As always Baby Brands Direct offers registered approved accounts, trade prices on all lines, volume discounts as well as a loyalty credit scheme and fast dispatch to 65 countries. Login here.